1. Prince (tetrarch) of Iturea and Chalcis from about 85 to 40 B.C., in which year he died; son of Mennæus. He tried to extend his kingdom by warlike expeditions (Strabo, xvi. 2, § 10); and ruled the Lebanon, threatened Damascus, subjugated several districts on the Phenician coast, and once had Paneas in his hands (Josephus, "Ant." xv. 10, §§ 1-3). In fact, the whole of Galilee had formerly been in the possession of the Itureans, and had been taken away from them in 103 by Aristobulus I. (ib. xiii. 11, § 3).The Jews thought themselves oppressed by Ptolemy, and hence Aristobulus II., at that time stillprince and sent by his mother, Alexandra, undertook an expedition against Damascus to protect it against Ptolemy (ib. 16, § 3; idem, "B. J." i. 5, § 3). Pompey destroyed Ptolemy's strongholds in the Lebanon and doubtless took away from him the Hellenic cities, as he did in Judea. When Aristobulus II. was murdered by Pompey's party in Judea (49 B.C. ), his sons and daughters found protection with Ptolemy ("Ant." xiv. 7, § 4; "B. J." i. 9, § 2). 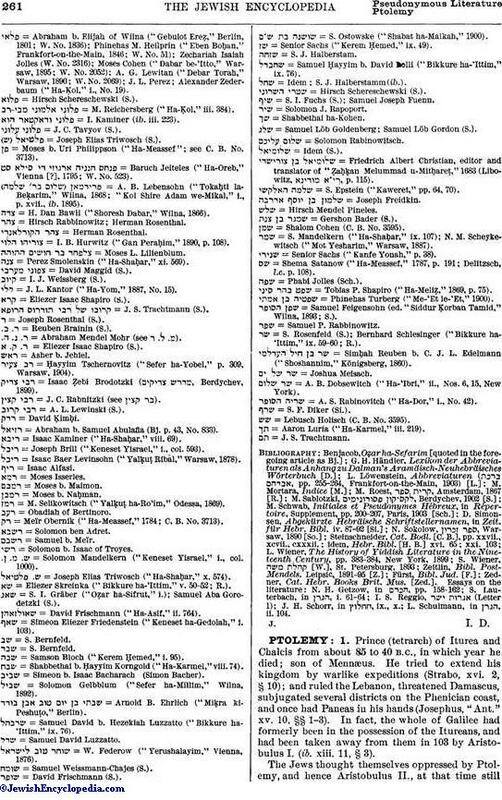 It may be that the national Jewish party at that time depended for support on the Itureans in Chalcis, and perhaps the following statement has reference to that fact: "On the 17th of Adar danger threatened the rest of the 'Soferim' in the city of Chalcis, and it was salvation for Israel" (Meg. Ta'an. xii. ).Antigonus, son of Aristobulus, also supported Ptolemy in his effort to establish himself as king in Judea ("Ant." xiv. 12, § 1). Ptolemy died just as the Parthians were invading Judea (ib. xiv. 13, § 3; "B. J." i. 13, § 1). He was succeeded by his son Lysanias.Bibliography: Grätz, Gesch. 4th ed., iii. 148, 174, 186; Schürer, Gesch. 3d ed., i. 712-713. 2. Strategus of Jericho; son of Abubus (= ), son-in-law of Simon Maccabeus. He wished to gain possession of the rulership over Judea, and hence when his father-in-law was visiting him at the fortress of Dok, near Jericho, in the month of Shebaṭ, in the 177th year of the Seleucid era (= 135 B.C.). Ptolemy gave a banquet at which he caused Simon and his two sons Mattathias and Judas to be murdered (I Mace. xvi. 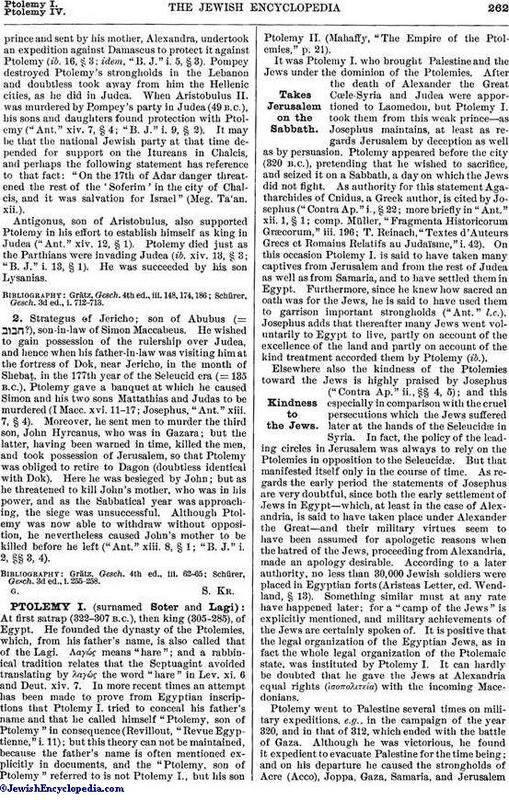 11-17; Josephus, "Ant." xiii. 7, § 4). Moreover, he seat men to murder the third son, John Hyrcanus, who was in Gazara; but the latter, having been warned in time, killed the men, and took possession of Jerusalem, so that Ptolemy was obliged to retire to Dagon (doubtless identical with Dok). Here he was besieged by John; but as he threatened to kill John's mother, who was in his power, and as the Sabbatical year was approaching, the siege was unsuccessful. Although Ptolemy was now able to withdraw without opposition, he nevertheless caused John's mother to be killed before he left ("Ant." xiii. 8, § 1; "B. J." i. 2, §§ 3, 4). Schürer, Gesch. 3d ed., i. 255-258.